Founded in 1999, Mindflash is a leader in learning management solutions, with more than 1,100 customers and more than 10 million courses delivered. Our customers shower our expert team of Customer Success Managers with praise, and our Net Promoter Score leads the LMS industry. In October 2016, we were named one of the Top 50 U.S. Small Companies to Work For by Fortune Magazine and Great Place to Work®. Ease-of-use is the foundation of a great user experience. That means every feature must be intuitive, absolutely necessary, and streamlined for simplicity. As a company, it should be easy to do business with us: straightforward communication; frictionless processes; and transparent business practices. Our product improves exponentially when we spend time with our users and listen to what they have to say. We keep channels of communication open to our users: usability labs, our beta testing programs, keeping an eye on Twitter. And as we develop the product, we maintain a humble approach, holding our own ideas loosely and constantly iterating. Both our product and development processes allow us to be nimble, responsive, and flexible. An Agile development team, a simple product architecture, and a mindset of ‘constant improvement’ means that when we see something to add, streamline, or fix, we can get it done quickly. We’re committed to building great products that help businesses succeed. That means reliable, scalable, and bug-free tools that you can count on. 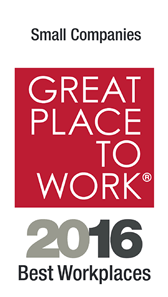 Mindflash was named one of The Top 50 Small Companies to Work For in 2016 by the Great Place to Work Institute and Fortune Magazine. See why more industry leaders choose Mindflash.